Did the Historical Society of Nova Scotia have the Oak Island 90 Foot Stone? Oak Island's famous Inscribed Stone, said to have been retrieved from the Money Pit in 1803-04, went missing by 1919. Many people have tried to locate it to no avail. Frederick L. Blair and R.V. Harris, two men very close to that time period searched for it in the 1930s, interviewing people such as Harry Marshall (son of Edward Marshall, whose shop it was said to have been last seen in) and calling upon many others. They did not find the stone. Others have taken up the search over the decades since, with the same result. Daniel Ronnstam, an Oak Island theorist, is among the latest to mount an effort to find this stone. He has set up a Facebook Group named "Locating the Oak Island Inscribed stone", in which the general public can submit leads on the stone's whereabouts. One clue that seemed to be a dead end was made by Rev. A.T. Kempton in a letter written to Oak Island Treasure Hunter Frederick L. Blair, which he received on April 19, 1949. In this letter Kempton states that he learned that the stone was in the possession of the Historical Society in Halifax, but that he had not been able to find anyone there that knew about the stone. I myself had followed up on this lead to no avail. I read through volumes of Historical Society publications and found nothing about Oak Island in general, let alone about the stone. Excerpt from a letter from Rev. A. T. Kempton to Frederick Blair in 1949, which states "I learned that the Stone was in the Historical Society at Halifax. I went there several times, but never found any one who could tell me about the Stone." It did indeed seem like a dead end. Now over a year later, there is a trail to follow which just opened up! The lead was found in an old letter, which has been kicking around research circles for years, written by John Hunter-Duvar, of the Historical Society of Nova Scotia, to George Cooke, Oak Island Treasure Hunter back in the 1860's. You see, Cooke had just finished supplying a local newspaper with a three part history of the workings on Oak Island that was published in the waning days of 1863. Hunter-Duvar upon reading the story in the paper, immediately wrote to Cooke asking about the Inscribed 90 Foot Stone. His letter was dated January 2nd 1864, but Cooke was away and did not answer it until January 27th, 1864. This was Cooke's reply. There is no known record of whether or not John Hunter-Duvar and the Historical Society of Nova Scotia ever got to see the stone, but if it was removed from the fireplace of John Smith's former farmhouse and taken to Halifax and put on display, I can't imagine that they did not get to see it. The new lead comes from the dates of these letters. Hunter-Duvar dated his letter January 2nd 1864 and Cooke dated his reply January 27, 1864. The clue might not jump out at you until you know that today's Royal Nova Scotia Historical Society wasn't founded until 1878, fourteen years after Hunter-Duvar wrote his letter! This society has been in constant operation until this day. This would have been the Historical Society that Rev. Kempton visited. No wonder he couldn't find anyone who could tell him about the stone. So if the current society wasn't the society who inquired, then who was? The answer was found recently in legislative papers of the Province of Nova Scotia. The founding members of this Historical Society read like a who's who of prominent citizens and political figures of that day. We find past and future Premiers of Nova Scotia, Supreme Court Judges, and even a future Canadian Prime Minister. Beamish Murdock wrote one of the definitive histories of Nova Scotia, and Thomas Beamish Akin almost single-handedly created the Public Archives that we know today. These men were all about preserving the history of Nova Scotia. If they were interested enough to inquire about the 90 Foot Stone, then they were indeed curious. Is it possible that they did indeed acquire the stone, and Kempton's information about a Historical Society having the stone was correct? Perhaps the stone yet resides in a private collection started by one of these gentlemen. All of the sudden we have multiple paths to follow up on. Let's see where they lead. Oak Island 90 foot Stone and the Kempton Cipher: Are the symbols mathematical symbols? In our last article, we shared some of our Oak Island 90 Foot Stone research with you, as it pertained to the man thought to have deciphered the symbols on the 90 Foot Stone. The only known representation of those symbols that we have today comes from what is known as the Kempton Cipher, so named because Rev. A. T. Kempton produced it in 1949 to both Oak Island treasure hunter Frederick L. Blair, and to historian and author Edward Rowe Snow. From this single source, we now have a few variations in the symbols because of interpretations made from the information Kempton supplied. For example, Snow reproduced the rectangle symbol as a Roman numeral two, while Blair's notes show it more as a rectangle. As Kempton's original notes can no longer be found, the best copy comes to us from the R.V. Harris archive papers housed at the Public Archives of Nova Scotia. Harris obtained his copy from Blair. In the image below, using an exact copy of how the cipher was presented in the Blair papers, we get the idea of how the symbols could be open to various interpretations. All four symbols highlighted below represent the letter "D". Rowe also interpreted the letter "M" as a Roman numeral one, as show below. Over a year ago, at the same time we were preparing to screen the movie Shakespeare: The Hidden Truth as a fundraiser at our local theatre, we discovered a photo of the never seen before Professor Liechti. No book on Oak Island had ever published a photo of Liechti before, so we were quite excited to make this find. That find led to another, which would open up a whole new ongoing line of investigation for us, pertaining to the 90 Foot Stone and the Kempton Cipher. Of course, to current knowledge, there is no proof positive that the Kempton Cipher represents the actual symbols that were carved on the 90 Foot Stone, taken out of the Money Pit on Oak Island, but it is the best conjecture currently floating around out there. So what was this new find? Notebooks from the Liechti household. These four old notebooks produced some very interesting and tantalizing possibilities. Within the pages of one notebook is related the story of The Red Cross Knight. For those who favour the theories revolving around Sir Francis Bacon and the Rosicrucians, this is interesting indeed. Another notebook was a visitation log, kept by Professor Liechti's wife Minna, which recorded visits with people bearing such names as Creighton, Smith, Marshall, and McNab. The brief notations of these visits do not tell us whether or not any of these people were related to the people who figure so prominently in Oak Island history. Perhaps Minna visited with them for reasons of church? We can't be sure, but it was interesting to see those names in her log book. What really caught our interest very quickly is that we started to see symbols from the Kempton Cipher jump out at us from the pages of the notebooks. Imagine trying to keep quiet in the viewing room of the archives when that happened! Take a look at this page from one of the notebooks. How many symbols from the cipher do you see on just this page alone? The centre dot circle, the triple dot, the triangle, the plus symbol, and depending on your interpretation, the letter "C" (some people think of it as a left bracket in the cipher, and maybe it is). Take a look at another page from the notebooks. Even the badly written Roman number one makes an appearance. One frustrating observation we made was that the first four or five pages were cut out of this notebook. What was on those pages that some previous Oak Island researcher made off with? Perhaps I assume too much. Maybe the original owner of the book had need of paper and cut those pages out. You can tell, from what remains of the pages, that some of those cut out had been written on. Now before we go any further, I do have to draw your attention to evidence that this particular notebook was used by Professor Liechti's daughters in their studies at Dalhousie University. One daughter was named after her mother Minna, and the other daughter was named Bertha. As one of the notebooks in the collection (the visitor log) belongs to Minna the mother, it may be her name on the page in the image below, but I suspect the names reference the two daughters. So where do we stand? Here we have Liechti notebooks, containing seven or more of the eighteen unique symbols that make up the Kempton Cipher, but they do not appear to belong to the Professor himself. What we realized was that many of the Kempton Cipher symbols were mathematical symbols in use in the late 1800s. Are all the symbols in the Kempton Cipher mathematical symbols? Mathematical symbols? Is it possible that they are nothing more than mathematical symbols? Not an ancient language? Not Alchemy symbols? Not Masonic symbols? To be sure, some of the symbols can be found in all of the above, but as it turns out, only mathematics uses the whole symbol set. None of the others use every symbol. This was very intriguing. Kel Hancock, Thomas Kingston, Petter Amundsen (who was not researching with us but was involved in the conversations in the discovery process), and myself, had a few exciting weeks as more and more of the symbols prove themselves to be a part of mathematics and mathematical notation. But how can we use this realization? If we accept that all the symbols are mathematical in origin, what does that tell us about the cipher and the person who created it? One of the loosely scientific tests we did was to ask a group of individuals from diverse backgrounds to fill out a form that was divided into 18 blocks. I asked these people to write one unique mathematical symbol in each of the 18 blocks. This was done without an explanation as to why. I wanted to see how easy it was for someone to be able to cite eighteen mathematical symbols. Out of the 30 people I tasked with filling out the form, twenty-six of them had a university education. Only one person filled out the whole form. The average number of symbols written on the form was 9. The only value in this exercise was that it illustrated that it isn't easy to come up with 18 unique mathematical symbols from memory. The only person to cite 18 unique characters was a mathematician. This suggests to me that the person who created the cipher was likely either trained in higher mathematics, like a mathematician, engineer, or surveyor would be, or this person turned to a mathematics textbook for his symbol set. That doesn't really narrow the field to much, but then again, how many people had a book on mathematics at hand in the 1800s or earlier? Perhaps we could analyze the symbols and prove the cipher a fake. Finding the symbols in the Liechti notebooks also drove home the point that many of those symbols were in use in 1887, and that perhaps Liechti himself used them to fake the cipher. Many Oak Island authors and researchers have raised the possibility that the cipher was made up to excite people and help sell shares in a new treasure hunting venture on Oak Island. If this was true then perhaps we could analyze the symbols and prove the cipher a fake. After all, symbols in mathematical notation have a documented origin. If any of those dates of first use were after 1804, then the cipher was more than likely a fake (if you accept that the were derived from mathematics). Let's take a look at each symbol in the cipher. To help us determine the date of first use of a symbol, we used the book shown below and written by Florian Cajori, which was recommended to use by the Professor of Mathematics at Dalhousie University. He said that this book was the go to book for reference by todays mathematicians. Cajori's A History of Mathematics (1894) was the first popular presentation of the history of mathematics in the United States. Based upon his reputation in the history of mathematics (even today his 1928–1929 History of Mathematical Notations has been described as "unsurpassed") he was appointed in 1918 to the first history of mathematics chair in the U.S, created especially for him, at the University of California, Berkeley. Several times during the assessment of individual symbols I thought I had found proof that that particular symbol was too new to have been used in a cipher that was supposedly on a stone and in the ground before 1804 (the year the stone was supposedly found), but each time I was able to push the "first use" date back to a time prior to 1804. We couldn't prove the cipher a fake in this manner. What I came to realize was that mathematical symbols get used and reused to represent different values in mathematics. Over the years, decades, and even centuries, one mathematician would use a symbol in his work, but no other mathematician would use it. Some symbols came into vogue and fell out of vogue, only to be snapped up again in the future, to be used for another purpose. To reach this point in my research, I have read more books on mathematics than I ever did in all my years of schooling combined. I scanned math books written in different languages all the way back into the 1500s, looking for these symbols in their equations. Sometimes the same symbol was used to represent totally different things. You see, as I came to find out, duels and been fought and cold wars had developed over the centuries due to disagreements in mathematical notation. European mathematicians would use a symbol to mean one thing, and British Mathematicians would use the same symbol to mean something else. Neither accepting the others methods. As David Blankenship commented to me, "What a stupid thing to fight over". After proving to myself that all the symbols used in the Kempton Cipher could be identified as being in use prior to 1804, I turned my focus towards the country of origin for each symbol. Perhaps a clue could be found there? Before we discuss whether that bore any fruit, lets take a look at what I was able to find out about each of the symbols as a mathematical symbol. As was mentioned before, some symbols are so universal that we can find them used in languages, and signage other the math, and some are so universal within mathematics that they are basic geometry that go back to math's misty beginnings. Let's identify and set aside those universal symbols right away. I have a page from an early textbook to help illustrate these symbols. As you can see, some of the symbols used in the cipher can be said to be derived from the very basics of math. Take a look at the image immediately above. Look in the narrative to the left. See the cross at the end of the fifth line? Note: Research by author Joy Steele has shown that a duplicate crossed out character in written word can mean that the preceding letter should be capitalized. I mention it here because it is an intriguing insight, though just like a crossed out character, it does not change the meaning of the cipher. Note the date of first use (always in red in the lower right-hand corner. the name of the mathematician to use the symbol will be displayed here as well). This was one of those instances where I though we had proven the cipher a fake. Further research turned up that this symbol's first known use was in 1720 by Christian Schlesser, and fit the symbols even better than the idea that it was an aleph did. I also investigated the idea that it was a poorly carved division symbol as well, which would have also suggested that the cipher was a fake. The "colon" symbol is one of the first symbols that started to suggest to me that maybe the symbols chosen in the Kempton Cipher could be used to determine a country of origin for either the cipher or the education of the person who created the cipher. The use of the colon symbol in a mathematical symbol set suggests that the person who wrote the cipher might be from the European Continent, or at least had been educated there. As our Professor Liechti had been. See, I wasn't yet closed to the idea that the cipher was faked. Was this another basic geometry shape like the others? Was it a poorly written Roman numeral one? It was really interesting to see it turn up in the Liechti notebooks as well. Other examples within the notebook were written properly, so perhaps this was simply hurried handwriting. It makes one wonder though. Kempton's eyesight was poor and his handwriting really large and messy when he wrote Blair in 1949. Kempton apologizes to Blair for this and states that his assistant wasn't there to write the letter for him. If Professor Liechti was the unnamed teacher who sent Kempton the Oak Island story with the cipher somewhere around 1909, he would have been older and retired as well. Did his daughter write the story up for him? Would that explain the Roman numeral one looking like it does, if indeed this is what this symbol is? As far as mathematics go, the symbol used in either manner as shown in the above images, were in use well before 1803. This 17th century German math book shows the Roman Numeral one in use back then. In the above image we see that the triple dot triangle as used in the Kempton Cipher is of the German usage, and not the English usage which would have seen it inverted. I feel that we are starting to see a bias towards mathematical symbols as used by German mathematicians. So there you have it. One and a half years of researching this possibility has led me to the observations noted in this article. Does it help clear up any of the mystery surrounding the cipher? Maybe not. Does it prove the cipher was faked? No. Does it prove the cipher is real? No, but it does show that it could be. There are no symbols within it that were not in use before 1803. I believe it also shows that someone with a higher education created the cipher. Could it have been Swiss educated Professor Liechti, at the bequest of less than honest promoters? It could. Could it have been an engineer or surveyor employed by the originators of a pre-1795 Money Pit. Yes, it could. Let me leave you with one other surprising piece of information. Let's look again at the minus oder weniger. The Swiss Mathematician Christian Schlesser is the only mathematician to use this symbol, that I have been able to identify in the last year and a half. Back then the trail ran cold on this angle of research. I could find nothing on this man. Recently however, in talking with a cousin of mine whose mother is German, he enlightened me to the fact that Schlesser is an Americanization of the name Scheßler. Armed with this new piece of intel, I just tried looking this mathematician up again, with much better results. Guess what? Christian Scheßler wrote books on mathematics and the design of fortifications! What does that mean? On the surface, it suggests that this man had the knowledge to engineer the legendary Oak Island works and to create a cipher that contains his unique symbol. If only we could place him in the service of the usual suspects. I have written to the mathematics society in Germany asking for a biography on Christian Scheßler. The research continues. Here are some illustrations from one of his books on the subject. This illustration seems to show a weapon which focuses the power of the sun to burn up ships. I can't read the German language, but if one of you can and would care to find out the details about this illustration, I would love to hear about it. Update: Howard, a reader, tells us that the "weapon is not of German origin, It's Greek, its Archimedes fire ray developed before 212 BC "
Our time is more limited than when we started this line of investigation. I wanted to disclose what we have been working on, in hopes that someone with an interest in Oak Island and better suited to explore the Swiss and German archives might be inspired to look into this further. As stated in the above image, "Nothing could be learned about this author of this very rare work". If you have managed to read this far into the quagmire that is this line of inquiry, I would be interested in what you think on the possibilities raised here. It may all be a strange coincidence, but I never suspected that it would lead here. Occam's Razor suggests that our Swiss Educated Professor Liechti created the cipher by drawing upon his European education. That would fit with the evidence that suggests the symbol choices seem to be derived from that region. However his motivation to fake a cipher depends upon the perpetration of a fraud by men trying to raise funds for continuing a treasure hunt, and that is something that has been suggested by some, but proven by none. On the other hand, would Liechti have chosen a symbol that fell out of limited use over a hundred years before he even began his education? I hope to hear feedback on the content of this article from those with a fresh eye. Mercury flasks on Oak Island? This is an example of a vintage stoneware Mercury jug. There has often been mention of mercury flasks having been found on Oak Island, but I had never seen any such artifacts, or even primary source documents to corroborate the stories, so I decided to go looking for evidence that the stories might be true. After all, the idea had to come from somewhere, but I was only familiar with the idea of mercury being used in preserving paper as presented in Petter Amundsen's theory. If such an artifact exists for Oak Island, then the container(s) may be able to be evaluated and pinned to a time period. This is what I have been able to turn up so far. The earliest mention of mercury flasks on Oak Island, that I was able to find, was found in author D'Arcy O'Connor's book, "The Big Dig: The $10 Million Search for Oak Island's Legendary Treasure". Published Oct 18th 1988. "What was found, according to correspondence between Gilbert Hedden and Burrell Ruth (and later confirmed to me by Hedden and Ruth's widows, as well as by Amos Nauss, Hedden's on-site foreman), were thousands of shards of broken pottery flasks in a shallow dump in Joudrey's Cove (north side of the island) in the summer of 1937. Some of the broken flasks contained traces of a liquid silver residue which Hedden had analyzed in Halifax, and which was found to be mercury. This was discovered at the time when Hedden had his crew scouring the island for any markers that might tie into the famous Mar Del map. And no, neither the mercury nor the flasks were (or could be) carbon dated, as neither is an organic substance. Those are the only first-hand accounts of the presence of mercury on the island that I have ever come across. " So it sounds as if O'Connor found some primary source papers that document this find. We have a substantial library of Hedden papers that we have either purchased or gathered from archival sources, but none of those mention the discovery of mercury on Oak Island. I would love to be able to read those papers in D'Arcy O'Connor's collection. It sounds as if he went to great effort to verify the paperwork by talking with as many of the people closely involved with Hedden efforts as he could. So in the Schmalz paper (1) we find corroboration of D'Arcy O'Connor's research. However O'Connor's book was published in 1988, and the Schmalz paper was written in 1995, so O'Connor's book may have been the sole source of this information for the Triton personnel, who Schmalz states made him aware of this knowledge. I suspect that O'Connor's book and the research behind it stand as the sole primary source stating that mercury flasks were found on Oak Island. Gilbert Hedden conducted one of the most thorough and organized searches of the island to date, so if he wrote that they found these flasks with mercury residue in them in a shallow dump near Joudrey's Cove, I would be inclined to accept it as fact. In season three of the History Channel's Curse of Oak Island television series, Rick Lagina facilitated a historical reconciliation between Fred Nolan and the Blankenships, who for decades were competing treasure hunters often at odds with each other. With the new collaboration between these parties the search for this shallow dump of mercury flasks should become a priority for the new alliance this summer, seeing as its location near Joudrey's Cove is more than likely on Fred Nolan's land. Incidentally, the "stone paved road" is said to run from Joudrey's Cove to the Pit area. It is interesting that the shallow dump is said to be in the same area. Relocating this dump would be a major find. Here's hoping! 1. Schmalz, Mark. Ritter, Gerhard. Image Enhancement and Data Analysis in Support of Archaeological Field Studies. Extended White Paper. 1995. In an Extended White Paper sent to David Tobias, of Triton Alliance, from Doctor Mark Schmalz and Doctor Gerhard Ritter, dated January 12th 1995 and entitled "Image Enhancement and Data Analysis in support of Archaeological Field Studies" we have found some very interesting information to relate to you regarding Oak Island and, in particular, the 10X Cavity. The two doctors worked together at the Center for Computer Vision and Visualization at the University of Florida in Gainesville Florida. The white paper summarized their "proposed work in image processing and data/technology characterization, in support of Triton's efforts in the Mahone Bay area", as was discussed with David Tobias and Bob Atkinson. It was quite a comprehensive proposal regarding the image enhancement of various film and photos taken on the island, as you can see from the Table of Contents from this proposal (shown below). The image enhancement techniques they used and the science behind those techniques were documented in great detail in their 66 page proposal, of which this excerpt is just a small sample (see image below). Did you catch that first sentence in the Proposal excerpt above? It reads, "Based upon our previous experience with Triton-furnished imagery". Previous experience. So this proposal was submitted as a plan to perform further work for the former treasure hunting company. Does that make you wonder what Oak Island photos or film they had previously worked on enhancing? It sure did for us. Efforts to contact Dr. Schmalz have not received a reply as of yet, but we did discover images from the 10X cavity that they had enhanced. These were found in the late Paul Wroclawski's Oak Island research collection. They were included in a 2007 PowerPoint presentation created by Oak Island researcher and author Les MacPhie, who told me they were gifted to him by David Tobias. We are grateful for Les MacPhie's permission to reproduce them here. Schmalz Image Enhancement of 10X film of "Chest" and "wooden pole"
Schmalz Image Enhancement of 10X film of a "Chest" in 10X. These are the clearest images we have seen yet of the contents of the 10X cavity. Doctors Schmalz and Ritter performed some impressive image enhancement on the blurry images most of us have seen in the past. It is unfortunate that Triton does not seem to have taken them up on their proposal for further work in this area. It would have been really interesting to see what they could have done with images of the rest of the cavity. So what do you think after seeing these images? Is it an actual chest? For over 200 years, Oak Island has mystified the general public and defied scores of treasure hunters. Vast sums of money have been pumped into it, lives and fortunes have been lost and state-of-the-art technology has been used – all for naught. We are no closer to the truth about what might have been deposited on Oak Island and by whom, when and why. Just when we ponder throwing in the towel and declaring the treasure a hoax, Oak Island slips us a new clue, such as the triangle rock from Season 3 of The Curse of Oak Island, which doesn’t figure in any of the known theories. These include pirate treasure, Viking gold, Aztec gold, the bones of Jesus Christ, the lost manuscripts of William Shakespeare and even the medieval Knights Templar, among others. The Templar theory is one of the more colourful ones. It is usually dismissed as fantasy due to a lack of hard evidence. And yet the Templars continue to hover in the back of our minds and those of the protagonists of the History Channel’s series. Oak Island and the Knights Templar have much in common in terms of secrecy, mystery and lore. Oak Island and the Templars were made for each other. The Poor Fellow Soldiers of Christ and the Temple of Solomon, as the Knights Templar were officially known, were a military monastic order formed during the Crusades. Their main job was to protect Christian pilgrims journeying to Jerusalem, a mission clearly stated at the founding but not carried out until years later. It is said that the first nine Templars spent nine years digging beneath their headquarters, located in the former stables of King Solomon. We do not know what they found, but they left something behind. In 1867, a British expedition led by Charles Warren discovered numerous tunnels under the Temple Mount that were explored again in 1912. Crusader-era artifacts were found, including a spur, a lance, a sword fragment and a Templar cross. (1) Many Old Testament treasures could have been hidden in the heart of the Temple Mount, the greatest of which was the Ark of the Covenant. Indeed, Solomon’s Temple was built specifically to house the Ark. Did the Knights Templar get a hold of it and use it as a catalyst to their fame, power and fortune? Another version sees the Ark spirited away to Ethiopia, home of the Queen of Sheba. Ethiopian tradition places the Ark inside one of the churches of Lalibela. These remarkable 12th-century edifices were hewn from basalt, one of the hardest rocks on earth. They look as if they were made with a cookie cutter shaped like a Crusader cross. (3) Who built them and with what tools? Ethiopians believe it was angels who took 24 years to accomplish the task and who stamped their creation with Templar crosses. (4) Not surprisingly, other parties took a deep interest in Ethiopia and the Ark: Portugal’s Knights of Christ in 1454 as well as the Jesuits in 1557. There is no solid evidence that the Templars possessed any of the great religious relics from the Bible, be it the Ark of the Covenant or the Grail. We suspect, however, that they owned the Shroud of Turin, which is believed to be the shroud of Jesus Christ. It surfaced in the 1350s, when it was put on public display by the de Charnay family. The de Charnays had strong ties to the Templar order: Geoffroi de Charnay, preceptor of Normandy, died next to grand master Jacques de Molay in 1314. (5) Curiously, no relic such as the Shroud of Turin was recovered from the Paris Temple, commanderies or Templar churches during the raids of 1307, when Philip IV had all of the Templars in France arrested. If the Knights Templar had the shroud and were able to keep it a secret from most of their members and King Philip, it opens up the possibility that they did the same with other treasures as well. With the return of the Crusaders and Templars from the Holy Land, Grail romances started to flourish and circulate. In Wolfram von Eschenbach’s Parzival, the guardians of the Grail are called Templeisens. Templeisens, or the Grail company, were knights who travelled overseas on secret missions, past Rohas (now Lalibela in Ethiopia). (6) Was it a beautiful literary coincidence or a not-so-subtle clue? More such clues exist in Chartres, whose magnificent Gothic cathedral was allegedly financed and masterminded by the Templars. As author Louis Charpentier describes: “There are at the north door of Chartres, called the door of Initiates, two small columns, carved in relief, one picturing the transport of the Ark by a couple of oxen, with the inscription Archa cederis; the other showing an Ark that a man is covering with a veil, or is taking hold of with a veil, near a heap of corpses among which one discerns a knight in his coat of mail, with the inscription, Hic amititur Archa cederis … or ‘Here things take course, you are to work through the Ark.’” (7) Were the Templars the last keepers of the Ark? The idea that the Templars had any sort of sizable treasure, let alone the Ark or the Grail, is not accepted by most historians. They see the Order of the Knights Templar as aged, defunct and broken in 1307. It is true that little of value was found by King Philip’s men when they ransacked the Paris Temple and all the commanderies. But it is also true that King Philip witnessed the Templars’ riches when they sheltered him from a rioting Parisian mob in 1306. He also saw the bullion brought by Jacques de Molay upon his return to France in 1307. Yet, within a year, all the visible or portable wealth was gone, as well as weapons and ships. Logically, we must ask ourselves if the Templars were forewarned and took precautions prior to the hour of doom on October 13, 1307. There is a long-standing tradition that a contingent of Templars escaped to Portugal and to Scotland. In Portugal, a kingdom they had helped create, they were welcomed by King Diniz, who incorporated them into a new order, the Knights of Christ. In Scotland, they allegedly entered the service of Robert de Bruce, who controlled the Highlands and who had been excommunicated by the Pope. For this reason alone, the Bruce-controlled part of Scotland was a perfect haven for the outlawed Templars. Robert de Bruce, who until then had mostly engaged in small battles, saw his luck change after 1308, when the Templars are believed to have boosted his ranks. His fight for independence culminated in 1314, when his army, outnumbered by three to one, won at Bannockburn. (8) Whether he sheltered the Templars or not, the knights were always treated leniently in Scotland. Despite King Philip’s urgent letters and a papal bull, the Scottish Templars were not brought in for questioning until 1309, two years after the trouble in France. At that time only two knights could be found. One of them explained that his brethren had fled overseas. We would assume he meant Ireland or continental Europe, but there is a possibility he was talking about Nova Scotia or North America in general. We learned in school that North America was discovered by Christopher Columbus in 1492. But long before Columbus dreamed of sailing west, it was already known to the Norse, who even resided in it. The Columbus throne shook in 1960, when Helge Ingstad came upon the remnants of a Norse settlement in L’Anse aux Meadows, Newfoundland. It is generally agreed that the place served as a stopover and was not the famous Leifsbudir (Leif Eriksson’s abode). There are various theories about how far south the Vikings actually travelled, and the destinations include Nova Scotia’s Yarmouth (9) and Cape Breton (10). Based on archaeological findings and written records, the Norse frequented North America for over 300 years, with the first voyage occurring around the year 1000 and the last one in 1347. In 1121, Bishop Eric Upsi (or Gnuppson) took it upon himself to sail to the continent. (11) Is it possible that the knowledge of North America was not limited to Norwegian monarchs and the Catholic Church but trickled down to the Knights Templar? Could the Norse have supplied the fledgling knights with a means of transportation? Among their crews were men from Orkney, and Orkney is only a raven’s fly from Scotland, metaphorically speaking. Why couldn’t the Templars stay in Scotland under the protection of Robert de Bruce? Initially, the Scottish king might have welcomed them, especially if they offered manpower, weapons, money and provisions from their properties in Scotland and Ireland. (12) However, things would have changed after Bannockburn, when the excommunicated king sought reconciliation with the Church, and harbouring fugutive Templars would not help the matter. They had a choice: throw off their white mantles and blend into the woodwork or find a new homeland where they could practise their (Gnostic) beliefs without fear. What of their treasure? Did it factor in their decision? Many people believe it remains hidden in the vaults under Rosslyn Chapel, a church famous for its pre-Columbian stone carvings of maize, aloe vera and other plants indigenous to North America. But there is also a legend that sees the treasure in Iceland (13) and, of course, on Oak Island. The Templar theory usually only considers 1307 as the year when the Knights Templar set foot in Nova Scotia for the first time. Templar researcher Gerard Leduc believes this happened much earlier and that Oak Island’s Money Pit was marked on a 1500s map by Italian explorer Giovanni da Verrazzano. The map shows the inscription “Cavo di Brettoni CLMERI,” which was translated as “the well of Brittons in the year 1150” by Professor Emilio Spedicato, University of Bergamo. (14) Professor Leduc points out that the Templar order had property and commanderies in Brittany, France. If both professors are correct and the Money Pit dates back to 1150, the Templars came to Oak Island as explorers, not as fugitives, and at a time when they were in full power. Can we find an artifact that would fit this scenario? Interestingly, there is an artifact from Oak Island just like that – one that throws colonial theories in disarray: coconut fibre. It is said that treasure hunters removed large quantities of it from the Money Pit and heaped it on the ground. Unfortunately, none of the Money Pit’s coconut fibre remains, and what samples we have come from the beach in Smith’s Cove. This wet fibre was subjected to numerous tests by reputable laboratories over a span of decades. The results were startling, dating it to 1168-1374, a perfect time frame for the Knights Templar. Skeptics dismiss this as a fluke or say that pirates, too, could have brought old coconut fibre with them in the 16th or 17th centuries. But why do this when coconut has annual growth and there is a fresh crop of it every year? If, however, the coconut fibre was actually brought by the Templars, it makes us wonder which route they took to Oak Island. Did they take the southern route to North America (like Christopher Columbus) or did they come from the north to Nova Scotia, sail south to the Caribbean and return to Oak Island? Why did they need coconut fibre? What delicate item was in their cargo hold? In 1168, the earliest year shown by the coconut fibre carbon-14 tests, the Templars were not yet in need of emptying the treasury in the Paris or London Temples. But if the treasure they protected was not monetary but religious, then a 12th-century journey is not so far-fetched. This was during the time when Prince Lalibela lived in exile in Jerusalem (from 1160 to 1185). After his return to Ethiopia, perhaps in the company of the Templars, he started building his seven churches. (15) The Ark of the Covenant would have been a hot item during the Crusades, and it is easy to picture the Templars with their hands on it. Similarly, the Grail became increasingly popular around this time – the first story about it was composed in 1182 by Chrétien de Troyes, followed by the Cistercians’ Queste del Saint Graal in the 1200s. (16) As romantic as it sounds, the 12th century was the prime time for the Templars to come in contact with the Ark and the Grail and to be entrusted with their safe removal from areas of deadly conflict. If these magical relics were not the reason why the Templars sailed to Nova Scotia in the 12th century, then what was? The majority of the theories of Oak Island see it as a repository, a place to which treasure was brought. Should we turn it around and consider it a place that was a source of treasure, we may find an explanation for the strange lines on the bathymetric map of Oak Island or for the triangle rock found in Season 3 of The Curse of Oak Island. What if the Templars mined gold on Oak Island? Its proximity to the Gold River and the Ovens, which experienced a gold rush in the 1800s, indicates such a possibility. The parallel shapes on the bathymetric map could be tailings from a mining operation. Are these tailings in the water because the gold digging happened in a distant past, when the ocean levels were lower? Or were they dumped there so as to not leave a visible trace on land? The Templars were involved in all kinds of industries, including mining. We know they owned mines in France and Scotland, and it is said that they also mined silver in Mexico. (17) If they could have accomplished that (i.e., extracting silver as far away as Mexico), mining gold on Oak Island would be much closer to home. Indeed, it has been suggested that Robert de Bruce’s secret source of income for his wars came from overseas. It would be quite the twist of fate if it were the Templars who had brought it to him from Oak Island. The Templar theory of Oak Island received a brief boost during Season 2 of The Curse of Oak Island, when treasure hunter Gary Drayton found a coin on the ridge above the Money Pit. It was cleaned up and held in front of the camera, where it flashed a tantalizing but very faint cross on its surface. The object was quickly dubbed a Templar coin and sent to the Nova Scotia Museum. Then came the crushing blow: The coin was not really a coin but a copper disc without any markings whatsoever. It was put on display in the Museum of Natural History in Halifax, next to authentic coins such as a Spanish piece of eight. That seemed to be the end of it – there were no medieval, let alone Templar, coins on Oak Island. But other coins have surfaced, ones that the museum is not aware of. These were allegedly found in Chester during road construction some time ago. They were identified as being from the Republic of Genoa, Italy, and dated to the 13th-14th centuries. Interestingly, among the Templars who fled to Scotland were Templars from Italy. But coins are notoriously unreliable proof – especially when they are found on the wrong side of the Atlantic Ocean – and so we cannot be certain how the Genoese coins came to be there. A much more substantial artifact that could be associated with the Knights Templar is Nolan’s Cross. It was discovered by Fred Nolan, who surveyed the island in the early 1960s and ended up owning a portion of it. He soon realized that a group of boulders, known as cones, formed a Latin cross with arms of 360 feet and a stem 867 feet long. (18) Where they intersected was a stone resembling a human head. The mystery deepened in 2003, when author Petter Amundsen located additional cones and proposed that Nolan’s Cross was part of a much larger design, the Cabbalistic Tree of Life. This symbol consists of 10 points called Sephirot, each representing a mystical or divine concept. The Sephirot have names – one of them is called Mercy. If we may bring up the Ark of the Covenant again, its gold lid was referred to as a mercy seat. Our thoughts stray to Nolan’s Cross and its cones, one of which could be Mercy. In classic Oak Island style, the Mercy point is missing or hasn’t been located yet, and so we are unable to ascertain if the Ark of the Covenant was buried under it. Cone Rock, Oak Island. Photo courtesy of Alessandra Nadudvari. Petter Amundsen’s theory centres on the Rosicrucians, a secret society very active at the time of William Shakespeare and Sir Francis Bacon. The Rosicrucians sought to build the New Temple in a spiritual and intellectual, rather than physical, way. That they adopted the Tree of Life concept from the Cabbala is likely, but were they the first and only Christians who could have installed it on Oak Island? According to Rabbi David Joseph Hayim Azulai, Zohar, a book of Jewish mysticism and source of the Cabbala, was brought to Spain on a Templar ship. (19) It would appear that the Knights Templar, who professed to be “of the faith of Solomon,” (20) might have gleaned the design of the Tree of Life before the Rosicrucians. Getting back to earthly matters, could any of the legendary underground works on Oak Island be attributed to the Knights Templar? The Order was renowned for its impregnable fortresses and castles. Even their churches had walls that were several feet thick and could be defended from within. The Templars always thought of exit strategy and often equipped their buildings with spacious underground tunnels. (23) Some of these were discovered only recently, making us wonder what other surprises the Templars have in store for us. The knights are known to have employed master masons Sons of Solomon, and the grand master himself “carried an abacus, the master builder’s staff.” (24) When we consider that masons such as these built Chartres Cathedral in just 26 years (1194-1220), the stone works of Oak Island pale in comparison. That being said, we have no proof that either the Templars or the Sons of Solomon built the coffer dam, artificial beach, box drains, flood tunnels and Money Pit on Oak Island, as much as some of us wish they had. Taken as a whole, the clues and artifacts from Oak Island do not make sense. They contradict one another. Why spend years building booby traps and a secret Money Pit only to leave a stone triangle pointing to the treasure’s location? Why cover up excavation by dumping the tailings in the ocean but then erect a giant stone cross to state “We were here”? Why pack ship crates with 500-year-old coconut fibre when fresh fibre is waiting on the coconut tree? Why make a triangle stone marker and place it on the bottom of the ocean so that only squids and divers can study it? It does, however, make sense if we perceive Oak Island as a project of multiple groups who came in different centuries and incorporated the existing structures into their own design. The Templar theory sees them returning to Scotland or Portugal, where they passed the secret of the Money Pit on to future generations. On the other hand, they could have stayed in North America, where they were free to live and practise their beliefs. There are numerous artifacts strewn over the East Coast and along major waterways – from Newfoundland to the Great Lakes and New York State – that bespeak of a Templar or other medieval presence. (26) Equally intriguing are the tiny Templar crosses marked on the early maps of Canada by its 16th-century explorers. Are we the first ones to look for the Knights Templar on this side of the Atlantic? The architects of Oak Island’s enigma did not want to be identified. They made sure that the more we’d dig, the deeper into the earth the elusive treasure would sink. We can theorize that they were the medieval Knights Templar, who would have been the envy of Indiana Jones. But short of finding an intact Templar tomb on Oak Island or the Ark of the Covenant wrapped in a Templar mantle, we simply cannot prove it. This does not mean, however, that we should scrap the theory altogether – none of the other theories fare any better when pressed to produce sufficient and irrefutable evidence. Until such time as Oak Island has yielded its last clue and all of its artifacts have been made public, the Order of Knights Templar will continue to be a contestant for the truth. More tunnels under former Templar castles and commanderies were uncovered in Slovakia (Slovenská L’upča, Mnich) and Austria (Kronberg). (25) There is a theory that Oak Island’s gold was tapped by American revolutionaries in the 1700s. Many of the founding fathers were Freemasons, and Freemasonry has a strong Templar tradition. A different theory, discussed by D’Arcy O’Connor in The Secret Treasure of Oak Island, claims that it was the British who hid money on Oak Island because they feared it would fall into the revolutionaries’ hands. a) A Templar cross carving found in the crypt of Notre-Dame-de-Bon-Secours Chapel in Montreal. This cross was either placed there by 17th-century missionaries or the chapel was built on a former Templar site and the cross was simply incorporated into the crypt. More information can be found in The Templars’ Legacy in Montreal, the New Jerusalem by Francine Bernier, pp. 62-63.
b) The Sulpician seminary in Montreal has a stone tower that dates back to the 17th century. In the walls of the tower are very small arrow slits that we would normally expect in a medieval building. Were the Sulpicians fighting monks? Correspondence with Gerard Leduc has revealed that these slits are not large enough for a gun barrel. He has also determined that they are aligned with equinoxes and solstices, similar to Newport Tower in Rhode Island. 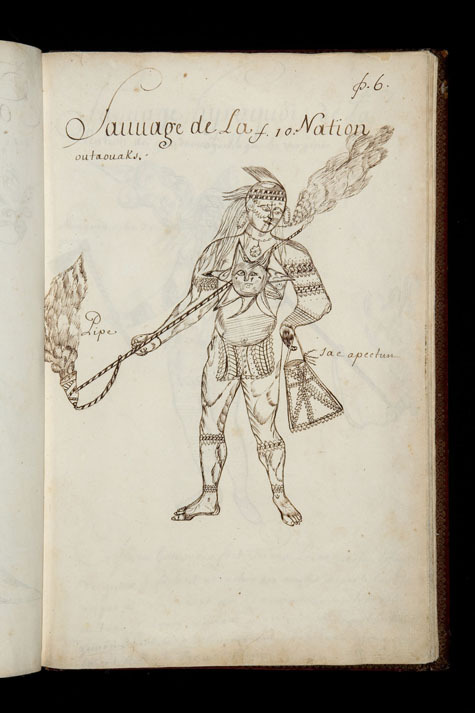 e) The Codex Canadensis, written and illustrated by Father Nicolas in the 17th century, shows drawings of the Iroquois with Templar crosses painted on their bodies. f) Father Le Clercq, a 17th-century missionary in New Brunswick, found that the Mi’kmaq he had come to preach to already knew of the cross symbol. Theirs was a double cross, which they venerated and displayed in a prominent place in their abodes. Curiously, the double cross can be found among the Knights Templar, on a seal of the preceptor of Poitou, as well as on the shield of Hugh, Count of Champagne, one of the founding knights. g) Chain mail found in the ground in Vermont, early 1800s. There is no surviving picture of it, but it was reported to the British Archaeological Association and described as being of a fine oriental design. i) A castle and orchards in the Genesee Valley, New York, described by W. L. Stone in the early 1800s. The Mohawk leader Joseph Brant was aware of pre-colonial settlements by white people who, unfortunately, got slaughtered by the Mohawks. He took it upon himself to investigate their origin and ended up in archives in France. j) In Swords at Sunset, Michael Bradley mentions a study by Concordia University that took a sediment core sample from Adolphus Reach. There was a layer of lye at a depth corresponding to the pre-colonial era. The Iroquois did not manufacture soap. k) Newport Tower, Rhode Island. This colonial “windmill” was built in the medieval Norse style that can be found in Orkney. The unit of measure corresponds with Scottish ells. The tower also bears a resemblance to the round Templar churches of Bornholm, Denmark, as well as the Templar baptistery in Convento de Cristo, Portugal. l) Westford Knight, Massachusetts. This stone carving is believed to be the effigy of Sir James Gunn, a knight in the service of Henry Sinclair, Earl of Orkney. Sinclair’s journey to the New World was described in the Zeno Narrative; however, it is not taken seriously by mainstream history. If the effigy does not represent Sir James Gunn, the question arises as to which other 14th-century knight it could have been. Escape from 10X. A close call on Oak Island. Most people with an interest in the Oak Island mystery are familiar with Dan Blankenship's narrow escape from being entombed, or worse, more than 90 feet below the surface when the 27" casing of Borehole 10X collapsed. Dan had been cutting through various spots in the metal casing of the borehole to investigate suspected voids in the surrounding soil, when the casing began to collapse and pinch off. Dan's quick grasp of the developing situation and his son David's fast reaction time in hoisting Dan up and out of the borehole almost certainly saved Dan's life. Remember, this was before the borehole was increased in diameter to 8 feet. It was still only 27 inch drill casing at this point in time. As you can see in the picture above, the seat on which Dan would have been sitting was not much smaller than the pipe into which it must fit. This is the same 27 inch casing that the five divers (including Dan Blankenship) known to have entered the 10X cavity prior to 1973 used to access that cavity at 235 feet below the surface. After the diving program ended, the searchers turned to investigating the suspected voids, encountered while drilling, in the glacial till above bedrock. There is little doubt that Dan Blankenship had a narrow escape from becoming the seventh person to die while treasure hunting on Oak Island. The fact that he carried on after this event is a testament to his dedication to solving the Oak Island Mystery. P.S. Many thanks to Les MacPhie and John Wonnacott for their research materials used in writing this article. The following article is written by long time Oak Island researcher, and former Oak Island tour guide, Danny Hennigar, and it will become part of the biography / people portion of our website. He writes about the experiences of Jim Kaizer, who worked for Robert Restall on Oak Island; particularly about that fateful day in 1965 when four people lost their lives in tragedy, and what occurred after that event. We hope you enjoy this contribution to the Oak Island knowledgebase by our guest writer. When all the oaks are gone and seven have died the treasure will be found, or so goes the legendary curse of Oak Island. No one knows for absolute certainty where the curse came from, who first penned it or even if there is any truth to it. One thing we do know, all the original, unusual looking oaks that gave the Island its present name are gone and six men have perished in the centuries old treasure hunt. Over the years local people were hired at Oak Island as labourers, drillers, helpers and many people still have close connections. I worked there as a tour guide, both my grandfathers were involved in one way or another and my father, a writer, wrote a poem about the famous Island. I only learned of my two grandfathers participation long after their passing and my awakening to the history of Oak Island. My maternal grandfather was a hard rock miner in the Chester Basin gold mines, he later worked for Gilbert Heddon driving shafts and tunnels in the late 1930s. My paternal grandfather owned and operated a saw mill and many a board foot of wood cut by grandad’s mill must surely lay deep under Oak Island’s surface. So it was, men looked to Oak Island for a chance to make a few bucks, feed their families and work at a job very much unlike anything available locally in fish plants, Christmas tree yards, barrel manufacturers, fishing on sea-going trawlers and a smattering of other small business opportunities. Word of mouth spread to those who wanted a job close by and to be paid a fair wage, one of the men who answered the call was Jim Kaizer from Robinson’s Corner, very near the Village of Chester. Jim was a short-statured, handsome man, powerfully built and used to a hard day's work for an honest dollar. He worked odd jobs, had his own dump truck at one time, had a beer bottle recycling business and worked on and off with a cement contractor from Chester Basin, Hilliard Cameron. He was also a Mi’Kmaq who was very proud of his heritage. He had a big family of eight boys to take care of and he snagged a job with Oak Island treasure hunter Robert Restall. Oak Island offered work such as digging holes, shoveling muck, moving boulders, repairing things, burning brush, moving heavy equipment and other jobs that would break an ordinary man's back, but to the Restalls and Jim Kaizer, it was all in a day's work. Later, after the tragedy, Jim was hired as a night watchman for Dunfield. I have often said, treasure hunting is not as glorious as it looks on TV or is portrayed in books and as general romanticism portrayed it. One of Jim's last pay days August 6th to the 13th 1965 grossed him a whopping $41.90. By today's standard that is not much, but back in 1965 even a five dollar bill went a long way. By the time it was over, four had died at the bottom of the pit and two were rescued. By all accounts, the afternoon of August 17th 1965 was a hot muggy day. A small crew of labourers was busy burning piles of brush while Robert Restall and his wife Mildred readied themselves for a short boat ride to the Village of Chester where a multitude of chores awaited them. Robert went down to Smith's Cove to check how the gasoline pump was working at the head of a shallow shaft they had been working on. What happened next will never be known for sure, but what we do know is that Robert Restall fell into the shaft, possibly overcome by carbon monoxide gas, an odourless, colourless and tasteless gas that may have accumulated at the top of the shaft head due to a present air inversion that day. If you have ever seen smoke from a chimney fall back down toward the ground instead of rise to the sky, you have seen an air inversion. Restall landed into approximately six feet of water, and as others nearby saw him fall, they followed with the hopes of a quick rescue. His son Bobby went down the shaft for his father as did Cyril Hiltz, Carl Graeser, Leonard Kaizer and Andrew DeMont. By the time it was over, four had died at the bottom of the pit and two were rescued. The autopsies declared the deceased had died by drowning. Much speculation and heated debate has developed over the years about why Restall fell in the hole. Leonard and Andrew were heroically rescued by a visiting fireman on vacation from New York State who happened to be there at the time of the tragedy and with the assistance of others at the scene, they were kept alive. These two men later made a full recovery. Witnesses at the scene reported that the smell of rotten eggs permeated the air (possibly dangerous, heavier than air hydrogen sulfide) around the hole and no one had the desire to immediately descend the shaft. Fire departments from Chester and Western Shore who responded to the tragedy devised a plan to recover the bodies. It was considered too dangerous to send a man down the shaft to recover the bodies so they intended to use a sharp grapple hook, it was the safest way and most agree, it was a tough decision made by practical men. Jim Kaizer's widow Beulah told me Jim was working around home while the tragedy unfolded on Oak Island and all day long had an odd burning desire to leave what he was doing and head for the Island even though he was not scheduled to work that day. When his Uncle Maynard came to give him the horrible news, wild horses could not keep Jim away and he sped off to the Island. A sobering and solemn scene confronted Jim as he arrived at the site. Firemen clad in black coats, helmets and rubber boots told Jim what had happened as best they knew and the heart wrenching plan was unfolded before him. By all accounts, the Restalls liked Jim a great deal and he thought the world of Robert and Bobby. Armed with a World War II vintage gas mask on loan from the Chester firemen on scene, Jim went down the shaft with a rope tied around his waist and recovered the four bodies of his friends and co-workers. Jim later said he could not live with himself if the recovery went ahead as previously planned, it just was not going to happen, not on his watch. He felt they deserved better care, even in death. Jim later told his wife a little about his experiences but he was hard to pry details from. The coveralls he wore the day of the tragedy smelled so bad of rotten eggs, even after repeated washing, Mrs. Kaizer could not wash the smell out of them. They were hung in the mud room and were never worn again. It did not end there for Jim Kaiser. Jim got hired on with treasure hunter Robert Dunfield shortly after the tragedy and continued with his Oak Island employment. Jim said he saw a pair of red eyes staring at him and was told to leave and never come back. One night, months after the tragedy, Jim stayed overnight alone in the tiny cabin once the home of the Restall family. Late in the evening, Jim was awakened by the sounds of the cabin rattling violently and experienced the sensation of having a heavy weight on his chest. Upon opening his eyes, Beulah told me Jim said he saw a pair of red eyes staring at him and was told to leave and never come back. Not being a believer in ghosts and the supernatural, he bolted from the tiny building to see nothing that could explain the noise, he was sure someone was having him on. But, next morning, to his utter shock, he found he was covered with bruises. He told Beulah one set of bruises in particular looked like four fingers and a thumb had gripped him tight around his arm. Jim's end of life in 1976 did not go well and it was premature but before I end my story there is another detail you should be aware of with regard to this remarkable man. Because Jim had such a long involvement with Oak Island he can fairly be credited with making a discovery of his own. On the southern shore of the Island, very near where Dunfield dug hole 10G over 100 feet deep looking for a strongly suspected second flood tunnel, he found a rock with strange markings. Some describe the rock's carving as depicting a ship, others say it is the letters AC H or AT H. The rock was broken into pieces by a treasure hunter and a section of it was placed on his fireplace hearth where it remained for decades. As a young man, I knew Jim, his wife and all of his eight boys, I attended school with some while others were too young to enter my circle of acquaintances until later in life. I have great respect for his whole family and he remains one of Oak Island's lesser known treasure hunters and dare I say, a hero.